07 - 11 CHEVROLET/ GMC/ HUMMER/ ISUZU. 2.9L DOHC L4 16V, 3.7L DOHC L5 20V. 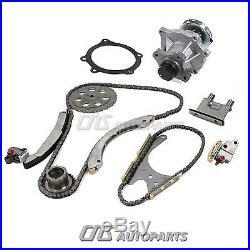 Brand New Engine Timing Chain Water Pump Kit(Balance Shaft Kit). 07 - 11 CHEVROLET COLORADO 2.9L 178ci DOHC L4 16V, VIN CODE "9". 07 - 11 GMC CANYON 2.9L 178ci DOHC L4 16V, VIN CODE "9". 07 - 08 ISUZU i-290 2.9L 178ci DOHC L4 16V, VIN CODE "9". 07 - 11 CHEVROLET COLORADO 3.7L 223ci DOHC L5 20V, VIN CODE "E". 07 - 11 GMC CANYON 3.7L 223ci DOHC L5 20V, VIN CODE "E". 07 - 10 HUMMER H3 3.7L 223ci DOHC L5 20V, VIN CODE "E". 09 - 10 HUMMER H3T 3.7L 223ci DOHC L5 20V, VIN CODE "E". 07 - 08 ISUZU i-370 3.7L 223ci DOHC L5 20V, VIN CODE "E". 1 Timing Chain (168 links). 1 Balance Shaft Chain (110 links). 1 Cam Sprocket (left 58 teeth). 1 Crank Sprocket (29 teeth). 1 Water Pump & GASKET. The item "Balance Shaft Timing Chain Water Pump Kit 07-11 Chevrolet Hummer 2.9L 3.7L DOHC" is in sale since Thursday, November 01, 2012. This item is in the category "eBay Motors\Parts & Accessories\Car & Truck Parts\Engines & Components\Timing Components". The seller is "cnsautoparts" and is located in South El Monte, California. This item can be shipped worldwide.